NASA's Space shuttle Endeavour, riding piggyback atop a Shuttle Carrier Aircraft, lands at NASA's Dryden Flight Research Facility in Southern California on Sept. 20, 2012, during the final shuttle ferry flight. Endeavour is headed to Los Angeles, where it will be placed on display at the California Science Center. EDWARDS AFB, Calif. — NASA's space shuttle Endeavour has returned to its birthplace. 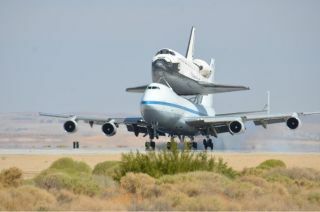 The youngest of the space agency's orbiters, Endeavour, flying piggyback atop NASA's modified Boeing 747 Shuttle Carrier Aircraft (SCA), landed Thursday at the Dryden Flight Research Center at Edwards Air Force Base in California. The 12:52 p.m. PDT (3:52 p.m. EDT; 1900 GMT) touchdown completed the third leg of the shuttle's ferry flight to Los Angeles, where it is destined for public display at the California Science Center (CSC). Dryden, which served as the primary West Coast landing site for the space shuttles as they returned from orbit, was also the initial departure point for the winged orbiters after they were assembled at a nearby plant in Palmdale, Calif. Endeavour, which was built in the wake of the 1986 loss of shuttle Challenger, left Dryden on its first ferry flight to Florida in May 1991. Endeavour's ferry flight route to Los Angeles International Airport (LAX), where it is set to land on Friday (Sept. 21) by 12 noon PDT (3 p.m. EDT; 1900 GMT), first brought it to Houston, where it landed Wednesday at Ellington Field near NASA's Johnson Space Center. The overnight stay was one of several flyovers and stopovers NASA and the CSC planned to pay tribute to the space agency's shuttle workforce. In addition to circling over the Kennedy Space Center as it first departed, Endeavour, mounted on the SCA, flew over Stennis Space Center and the Michoud Assembly Facility on its way Texas. The centers tested the shuttle engines and built the large external fuel tanks, respectively. On Thursday, Endeavour and the SCA left Ellington Field at 7:03 a.m. CDT (8:03 a.m. EDT; 1213 GMT) and flew over Johnson Space Center before heading for a low pass over Austin near the Texas State Capitol building. The jet and shuttle duo then continued to Biggs Army Air Field in El Paso, landing at 8:12 a.m. MDT (10:12 a.m. EDT; 1412 GMT) to refuel. Space Shuttle Endeavour is ferried by NASA's Shuttle Carrier Aircraft (SCA) over Houston, Texas on September 19, 2012. NASA pilots Jeff Moultrie and Bill Rieke are at the controls of the Shuttle Carrier Aircraft. Photo taken by NASA photographer Sheri Locke in the backseat of a NASA T-38 chase plane with NASA pilot Thomas E. Parent at the controls. Taking off from Biggs at 11 a.m. MDT (1 p.m. EDT; 1700 GMT), Endeavour and the SCA then made low-level flybys of White Sands Missile Range and NASA's White Sands Test Facility near Las Cruces, N.M., as well as flew over Tucson, Ariz., en route to California. White Sands serviced the space shuttle thrusters between flights, as well as was the landing site for one early shuttle mission. The Tucson flyover was made at the request of Endeavour's final mission commander Mark Kelly, whose wife, former Arizona congresswoman Gabrielle Giffords, survived a gunman's attack in 2011. Endeavour then arrived at Dryden, where it will spend the night before departing to complete its cross-country trip on Friday morning. NASA televised Endeavour's landing at Dryden live on NASA TV and via a webcast, including live views from the air taken from a nearby chase plane. Scheduled for a sunrise takeoff from Dryden, Endeavour will first salute its birthplace with a flyover of the cities of Palmdale and Lancaster, as well as the nearby towns of Rosamond and Mojave, before heading to Sacramento. The air- and- spacecraft combo are expected to fly over the California State Capitol Building and then visit the San Francisco Bay Area. Endeavour and the SCA will then fly low over NASA's Ames Research Center at Moffett Field, Vandenberg Air Force Base and the Jet Propulsion Laboratory in Pasadena, prior to circling Los Angeles. While over L.A., Endeavour and the SCA are expected to fly above Disneyland, the Getty Museum, Griffith Observatory, the Queen Mary in Long Beach, Santa Monica Pier and Universal Studios in Burbank. The ferry flight will also pass over the Boeing plant in Seal Beach and SpaceX headquarters in Hawthorne, where the commercial crewed spacecraft planned to replace the shuttle taking astronauts to low Earth orbit are being designed and built. Finally, between 11 a.m. and 12 p.m. PDT (2 to 3 p.m. EDT; 1800 to 1900 GMT), the SCA will bring Endeavour in to LAX for its last ever landing, where a ceremony will welcome the shuttle's arrival. Later on Friday evening, shuttle engineers will get to work hoisting Endeavour off the jetliner and onto an overland transporter, for its two-day, 12-mile (19-kilometer) road trip to the science center, Oct. 12 and 13. The CSC plans to open its new Samuel Oschin Space Shuttle Endeavour Display Pavilion on Oct. 30. Share your photos of the ferry flight with collectSPACE.com and SPACE.com!Send in your snapshots of Endeavour atop the Shuttle Carrier Aircraft to contact@collectSPACE.com and SPACE.com managing editor Tariq Malik at tmalik@space.com. See shuttles.collectspace.com for continuing coverage of the delivery and display of NASA's retired space shuttles. Follow collectSPACE on Facebook and Twitter @collectSPACE and editor Robert Pearlman @robertpearlman. Copyright 2012 collectSPACE.com. All rights reserved.